I am spending a few days in Krakow while on the way to meet a priest friend of mine for some vacation. In addition to enjoying my first visit to Krakow in and of itself, my goal these days is to do some advance planning and information gathering to assist the 175 pilgrims from the Archdiocese of Indianapolis who will be coming to Krakow this coming July for World Youth Day – along with a couple million other young Catholics and Pope Francis! According to the digital coundown clock above the main entrance of St. Mary’s Basilica on the Main Market Square in Krakow, there are only 145 days left until the beginning of World Youth Day – and it looks like the city is getting ready. I arrived in Krakow a little after noon, and so only had the afternoon to explore the city. My primary goal was to spend considerable time at Wawel Cathedral – the mother church of the Archdiocese of Krakow and a place that holds a special place in the hearts of all Poles and in the life of St. John Paul II. More about Wawel in a bit. On the way there, and in my general wanderings around Krakow this afternoon, I quickly understood why this city is sometimes called a second Rome – I have never been anywhere other than Rome with so many churches in such a compact area! There are over 120 churches in the old town of Krakow itself – often there’s not just a churh on every block, but a few churches on every block. And because the Catholic Church is alive and vibrant in Poland, these churches are alive and vibrant as well. During World Youth Day, many of these churches will be sites of liturgies, Eucharistic Adoration, concerts, and other events – giving pilgrims countless opportunities to experience the many different churches in this city, of all sizes, various styles of architecture, and containing some breathtaking religious art. One of my favorite finds today was a pulpit that is designed as a silver and gold boat affixed to the wall of a church, home to a community of Poor Clare nuns. One of the other unique aspects of the Church in Krakow is the number of canonized Saints associated with this city … which brings us to Wawel Cathedral. An ancient church – with foundations over a thousand years old and chapels and walls built on over the years – Wawel Cathedral began as the royal chapel for the kings of Poland – and is the burial place of most of the royal families of this country, including one queen who is a canonized Saint, St. Jadwiga. It also contains the tomb of the martyred bishop of Krakow, St. Stanislaw, killed down the hill from the Cathedral by an angry king. And in the crypt of the Cathedral, you can visit the St. Leonard Chapel, where St. John Paul II celebrated his First Masses as a priest. Wawel is also where he was ordained a bishop and served as the Archbishop of Krakow. I have long heard Wawel referred to as the heart of Poland – and as the most meaningful place on earth for St. John Paul II. Having been there and prayed today, I begin to sense what all that means. In less than a week, Pope Francis will officially inaugurate the Jubilee of Mercy by opening the Holy Door of St. Peter’s Basilica in Rome. Soon after, Holy Doors will be opened in cathedrals and shrine throughout the world, and we will enter into a year-long celebration of God’s mercy and opportunity to grow in the way we show mercy in concrete ways to our brothers and sisters. Pope Francis has repeatedly identified preaching at Mass as one of the most important tasks of bishops, priests, and deacons in helping to form missionary disciples. The Jubilee of Mercy can provide a structure for sustained, ongoing preaching on a common theme. The following preaching plan proposes two phases of preaching during the Jubilee of Mercy. The first phase begins on the Second Sunday of Advent, immediately prior to the opening of the Jubilee Year, and continues intermittently through the Easter Season. It focuses on the major themes of the Jubilee Year – mercy, forgiveness, reconciliation, and jubilee. The second phase is spread through Ordinary time in the summer and fall of 2016 and provides suggested links in the Sunday Lectionary readings to preach individually on each of the Corporal and Spiritual Works of Mercy. This preaching plan can serve as a guide for those who preach at Mass, with each homilist able to decide for himself when to focus on the given themes. Especially during phase one, there are many and varied opportunities provided by the Lectionary to preach on themes of mercy, forgiveness, and reconciliation. It could also be possible to use these Lectionary connections to guide parish faith formation programs, small group discussions, or any of a variety of other parish or school programs. A downloadable file of the Jubilee of Mercy Preaching Plan can be found here. Today was the second time I have had the honor of concelebrating a Mass with Pope Francis presiding – the first was at World Youth Day in Rio de Janeiro, Brazil, in 2013. Today, it was in a city that is near and dear to me – my college city, in my own country: Philadelphia. Participating in any event with the Holy Father is amazing and memorable – and these days, I find just as much, if not more, joy in being able to witness other people have encounters with the Pope, often for the first time. Our pilgrim group was blessed with some great encounters, and I know that I have not yet heard them all. But here’s my story. First … a picture … my view for the Mass. I left our hotel about 8:00 Sunday morning with Msgr. Bill Stumpf and Deacon Pat Bower from the Archdiocese of Indianapolis. We walked through still fairly empty streets to reach a security checkpoint, then continued walking along the Benjamin Franklin Parkway to reach the Philadelphia Museum of Art, where clergy would be vesting for the 4:00 pm Mass. Our journey was smooth and uneventful, and we arrived at the museum by 9:05. They had coffee and pastries for us, and then a great gift – the opportunity to walk through the museum’s art galleries while we waited for lunch and the actual preparations for Mass. The museum even had a number of their tour guides stationed in various galleries, and we enjoyed the opportunity to see and learn about some fantastic works of art, including perhaps my favorite painting of all time – Henry Ossawa Tanner’s Annunciation. 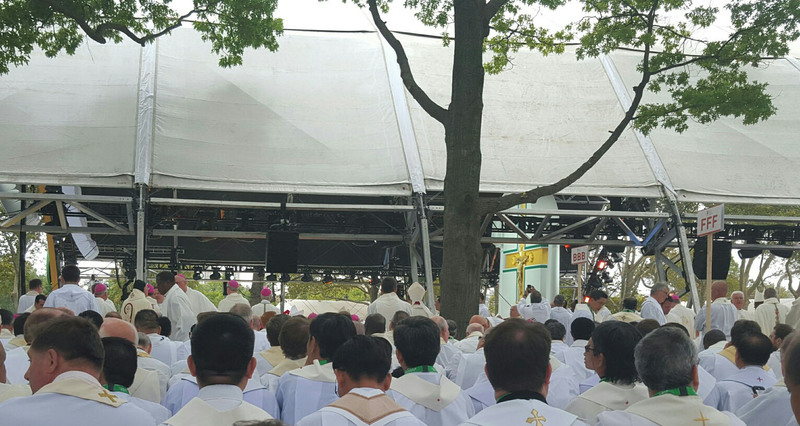 Then, we ate lunch, vested, and got in line with the 1,500 or so other priests to prepare for Mass. While we could not see anything, we could hear fairly well – the words of Pope Francis, the lectors, the cantors, the priests around us. We were able to join in song and responses. Perhaps most importantly, we could hear the voice of the Holy Father – the voice of the Universal Shepherd of the Church, our earthly Shepherd, who calls us to follow not his own voice, but the voice of the one Good Shepherd, Jesus Christ. The sheep of God’s flock heard the voice of our shepherd, and just in hearing that voice, we are called to follow him to an encounter with God. I didn’t need to be able to see the altar or even the color of the Pope’s vestments in order to hear his voice. But if you look again at the picture above, there is one thing that I could see very clearly throughout the Mass – the body of Jesus on the huge crucifix in the back of the sanctuary. I couldn’t see anything else of what was happening during Mass, but I could see Jesus on the cross – I fixed my eyes on him, and that was all I needed. I looked upon the one who was wounded and broken and killed for our sins, who rose from the dead to give us life, and who calls us to follow him and to lead others to him. In the end, any encounter with the Pope – as with any other Christian – must necessarily lead us to an encounter with Jesus Christ if it is authentic. I didn’t come to Philadelphia to see the Pope as much as to be inspired to a greater love of Jesus Christ by being in the presence of a great disciple and our Universal Shepherd. In case there had been any temptation to forget that, the visual was placed right in front of me. A companion piece to the famous LOVE sculpture in Philadelphia was erected before the World Meeting of Families. 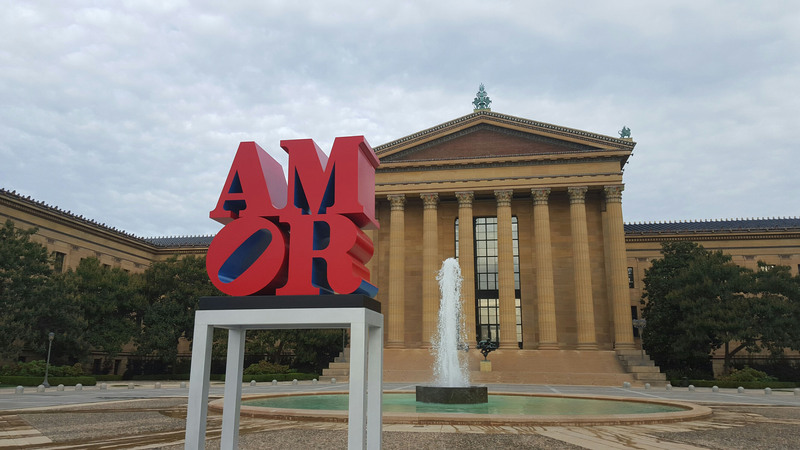 It’s on loan to the city and stands in front of the Philadelphia Museum of Art as AMOR – love in Latin and Spanish. It became clear this week – if it wasn’t before – that many, many people in this country love Pope Francis. And he loves Jesus and the Church and the poor and children and the elderly and prisoners and priests and religious sisters and brothers and families and those who don’t fit into any family. My hope and prayer is that our love for Pope Francis is more than infatuation or admiration for a man of holiness, humility, authenticity, and joy – but a deep and abiding love that compels us to do good for others and leads us closer to the One who is Love – God the Father, the Son, and the Holy Spirit. There is an excitement and energy in Philadelphia today that is contagious and has brought a festive and upbeat atmosphere to the city. Each day this week, more people have been arriving in Philly, and today the crowds are noticeably much larger – while at the same time streets have gradually been shut down and security dramatically increased. The combination of traffic-free streets and massive numbers of joyful pilgrims waiting for the arrival of Pope Francis has made Philadelphia the place to be for Catholics and all people of good will. Especially as we have been watching the Holy Father’s visits to Washington, DC, and New York, listening to his powerful words and witnessing his love and joy, we are becoming more and more excited that his next stop is the city that we are in – and that tomorrow, he will join us in prayer and celebration of family life. This afternoon, the pilgrims from the Archdiocese of Indianapolis gathered for a Mass at St. John the Evangelist Church, just a few blocks from the hotel that has been our residence for the week. Archbishop Joseph Tobin presided and preached, and we were also joined by Msgr. Bill Stumpf, our Vicar General, and Mickey Lentz, our Chancellor. We thought that this was going to be a Mass primarily for our Indianapolis group, but St. John’s is the epicenter for many spiritual events this week, and the church ended up being packed full for our 2 pm Mass. Immediately following the Mass, Gianna Emmanuela Molla was scheduled to speak in the church about her mother, St. Gianna Molla. And, at the same time, in the lower level crypt church of St. John’s, the relics of St. Maria Goretti were displayed for veneration – drawing long lines of people as well. This particular church plays an important role in Philadelphia Catholic history, having served as the Cathedral during the time St. John Neumann was bishop of Philadelphia and also the home parish of St. Katharine Drexel and her family. What a joy it was to prepare for the events of this weekend with our own Archbishop as well as fellow pilgrims from around the country and the world in this historic church. Earlier today, during some free time before the final keynote talk of the World Meeting of Families (given by Cardinal Sean O’Malley and Pastor Rick Warren), I ventured down to Independence Hall. Final plans were being made for Pope Francis’ speech there tomorrow afternoon (see picture below), but everything was open to visitors, so Sean Gallagher, the reporter for our Archdiocesan newspaper who has been with us this week, and I got a private tour of one of the most historic buildings in the nation, where both the Declaration of Independence and the Constitution were adopted and signed. There is so much history to absorb throughout this city! This evening, our pilgrims will gather for a group dinner and then get a good night’s rest before two very long days this weekend. 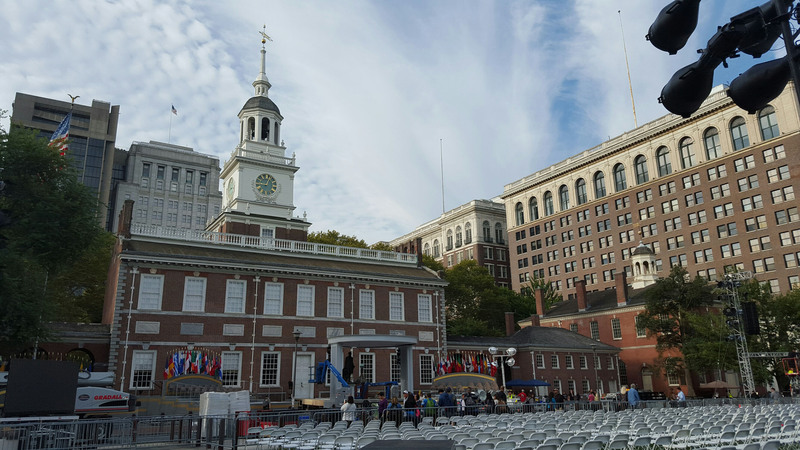 Most of us plan to spend virtually all of Saturday and Sunday on the Benjamin Franklin Parkway either waiting for or joining in the two primary papal events – the Festival of Families on Saturday and Mass on Sunday. 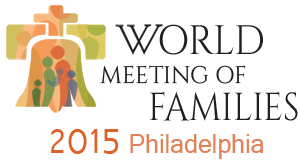 I know many other pilgrims from the Archdiocese of Indianapolis and countless other places are making their ways to Philadelphia right now, and we look forward to having them join the joyful community of pilgrims in this city. And, of course, we anxiously await the arrival of Pope Francis! I felt like we were driving toward a fire or into the path of an oncoming hurricane. As our pilgrimage group made our way to Philadelphia for the World Meeting of Families, we saw signs along the way encouraging us to turn back – literally. Soon after crossing into Pennsylvania, highway information signs were broadcasting the message: “Pope to visit Philadelphia September 26-27. Expect delays. 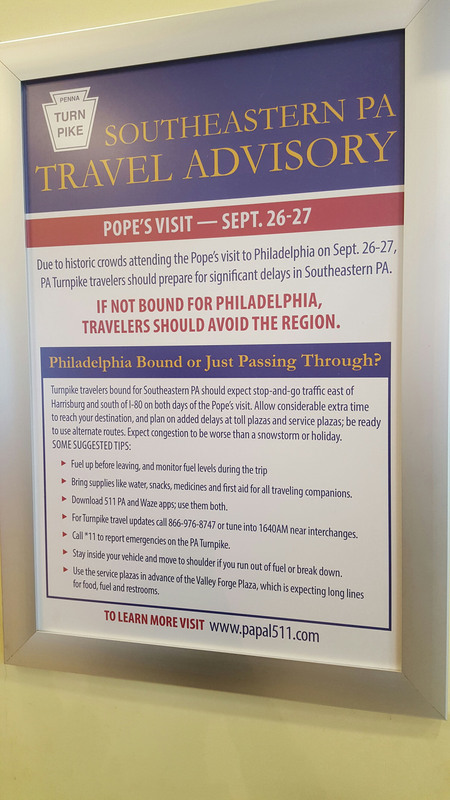 Seek alternate routes.” At a Pennsylvania Turnpike rest stop, we encountered travel advisory signs urging us to avoid the Philadelphia area unless we are going to see the Pope (see picture below). It said to expect congestion worse than a blizzard. Be sure to fuel up your car, bring plenty of food and water with you in case you get stranded, and really, if at all possible, just avoid the area. But that was exactly where we were headed. The signs continued and increased in intensity as we approached Philadelphia. At one point along our journey, we prayed the rosary as a group, and driving through the rolling hills of the Laurel Highlands in western Pennsylvania, seeing message after message urging us to turn around, I got the distinct feeling like we were heading toward a fire or into the path of a hurricane against all advice. And, really, that’s not far from the truth. We as a Church and as individual followers of Jesus Christ are often moving against the stream of our culture, our eyes fixed on a goal of holiness and selfless love that the world around us tells us to avoid at all costs. And, what’s more, as Jesus said, he has indeed come to set the world on fire – and when we orient our lives toward him, we are hoping that our hearts, too, will be set ablaze with love for God and neighbor. Who knows exactly what this week will bring. But today, Pope Francis arrives in the United States for the first time. Our pilgrim group will join with thousands of others to officially begin the World Meeting of Families. The city of Philadelphia is preparing to welcome visitors at the same time that it is encouraging anyone not coming to see the Pope to stay far away. And Jesus Christ remains in our midst, calling us to follow not the signs of the world but the sign of contradiction – the cross on which death was destroyed and life eternal made possible for those who believe. This morning, I boarded a bus with 45 other pilgrims from the Archdiocese of Indianapolis to travel to Philadelphia for the World Meeting of Families and visit of Pope Francis. The members of our group were chosen to represent the variety of families and diversity of the Archdiocese – young and old, parents with children, young adult couples, single mothers and children, a priest, a deacon and his wife, single people, from a wide range of ethnic backgrounds and parish communities. Needless to say, we are excited to be representing the many people and families of the Archdiocese of Indianapolis this week – and also anxious to bring what we learn and experience back to our parishes and communities. Here’s an overview of what we will experience this week … as most people are aware, Pope Francis is on his way to the United States (he is currently in Cuba). This will be his first visit to our country, and while here he will visit Washington, DC, New York, and Philadelphia. But not everyone is aware of the reason for his visit – he is coming to the United States specifically because of the World Meeting of Families, an event held every three years in cities around the world to celebrate the family and to grow in understanding of the place and role of the family in the Church and in society. If it were not for the World Meeting of Families in Philadelphia, Pope Francis might not be coming here. The Holy Father will be in Philadelphia for the closing celebrations of the World Meeting of Families – a Festival of Families on Saturday and a Closing Mass on Sunday. We will be at both of those gatherings, along with hundreds of thousands of other people (including a number of other pilgrims from the Archdiocese of Indianapolis). But we will be in Philadelphia for several days before these papal events in order to attend the entire World Meeting of Families, which is a series of workshops, conferences, exhibits, and Masses with about 17,000 other families from all over the world. Our pilgrims will be able to meet and dialogue with other families and attend sessions on topics as diverse as fostering vocations in the home, celebrating the liturgical year as a family, a Catholic approach to family finances, infertility, the importance of forgiveness in the family, what we can learn about family life from Islam and Mormonism, and much more. Each day will also include a keynote talk – speakers include Cardinal Sean O’Malley, Bishop Robert Barron, and Pastor Rick Warren – as well as Mass and several other events. By the end of the week, many more people will join us for the Festival of Families and the Papal Mass – but our group is among the smaller group of pilgrims (17,000 vs. 1.2 million) that will be attending the entire World Meeting of Families.